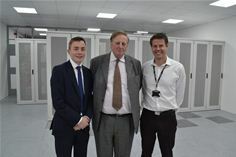 Trafford Council Leader Sean Anstee visited the Chief Executive Officer of Trafford’s latest new employer, LDeX2 Datacentre, Rob Garbutt earlier this week. He was joined by Executive Member for Economic Growth and Planning, Cllr Michael Young. As well as welcoming Rob and his Datacentre business to the Borough and taking a tour of the new facility, they took the opportunity to reinforce the hugely positive steps being taken by the Council, working with local businesses of all sizes, to build on Trafford’s reputation as the North West’s economic powerhouse. Established in London in 2011 and with business going from strength to strength, Rob announced in May 2015 that LDeX had chosen Trafford Park as the location for their second datacentre, the 10,000 sq. ft. LDeX2. This business expansion brings with it 25 new employment opportunities in a range of roles including technical, marketing and sales. Cllr Anstee said he was excited about this latest investment in Trafford and also the company’s commitment to work with the Council to promote Trafford as a ‘digital hub’. “Trafford is recognised as having a strong, resilient economy and the continued investment by companies of all sizes in the Borough is helping secure Trafford’s economic future. It is great that LDeX is moving into Trafford Park, one of Europe’s largest industrial parks and home to many diverse, thriving companies, including a rapidly growing digital and creative centre . The fact that this expansion plan also brings with it 25 new job opportunities is fantastic news for the area. Commenting after the visit, Rob Garbutt said: “I am delighted to be bringing my datacentre business to Trafford, and I am particularly excited to be part of the ongoing and future development of the Trafford Wharfside area. The LDeX2 datacentre opened last month and recruitment for the 25 positions has started. Karen Galvin, Trafford Council, Marketing and Communications Team, 0161 912 1136. LDeX Group provides carrier neutral London colocation and data centre facilities in London and in Manchester. LDeX own, operate and manage their facilities, providing London and Manchester colocation services to a range of industry sectors to protect the availability of data, applications, ecommerce and online presence.